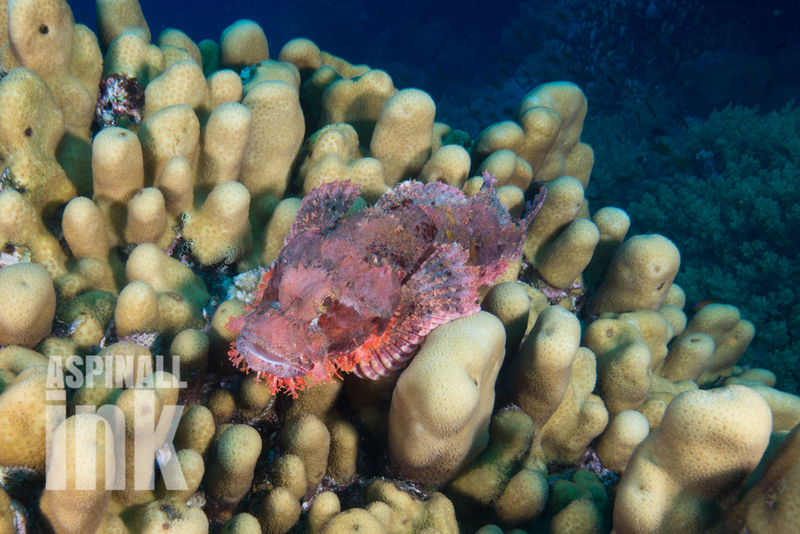 Many fish are able to change their coloration to allow them to blend in with their background, and one of the best examples of this is the scorpionfish. 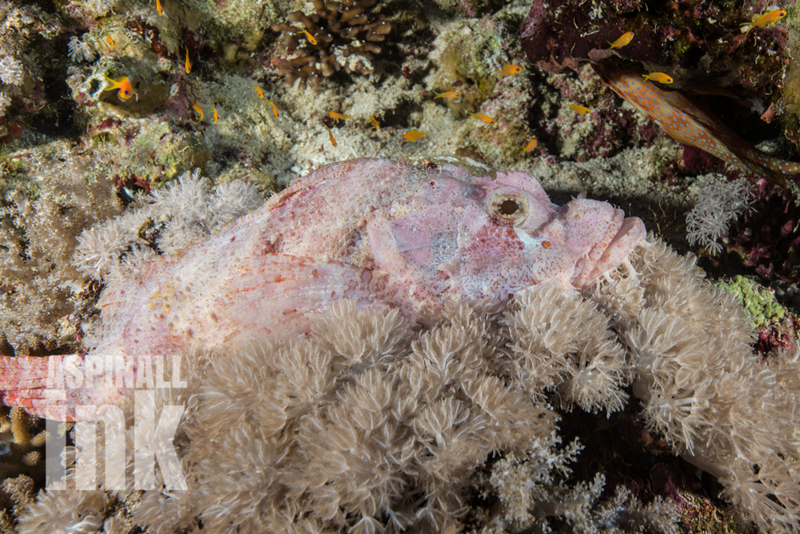 Smallscale Scorpionfish hail from a family (Scorpaenidae) with many members that have exceptional camouflage. 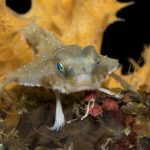 Many employ patternation, coloration, skin textures, and even folds, flaps and ‘frills’ of skin that help the fish to blend in seamlessly with their background. 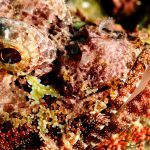 On many an occasion, I have swum straight past a scorpionfish and not noticed it resting on a rock covered in coraline algae. Only when it breaks cover to escape my lumbering form does the fish become clear. Such camouflage is necessary for an ambush predator that prefers to stay motionless and hidden until its prey ventures near. 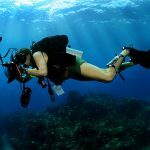 Only then will the fish open its cavernous mouth to engulf its prey. The fish pictured above, resting in a bed of xenia, shows just how much the species can alter their coloration to blend in. 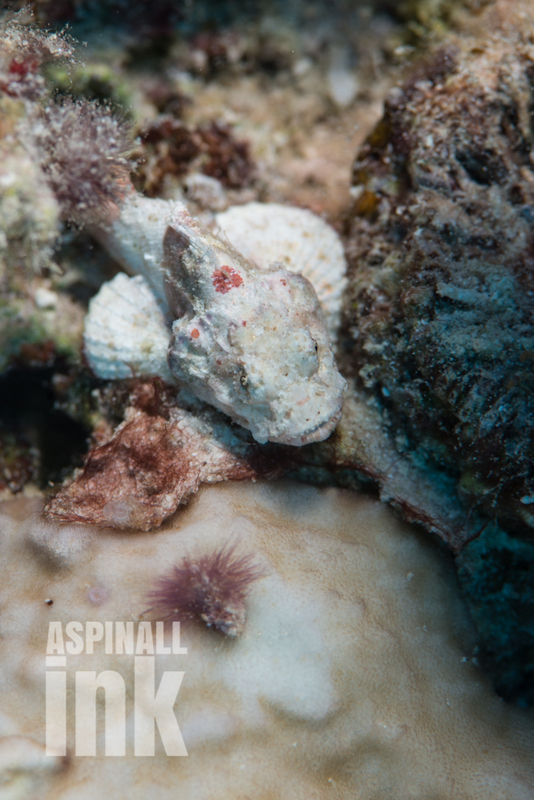 I wouldn’t say this is best-camouflaged scorpionfish I’ve ever seen, but full marks for effort! More ‘standard’ coloration. I think this fish had been disturbed and would not remain in this coral head for long. Normally, these fish show a range of colors between pinks and brick reds; I have never seen one quite this pale. This scorpionfish at a little over an inch long is the smallest I’ve ever seen and is also trying the white ‘theme’.